Can Brows with a Green Colour Change be Corrected with Tattooing? 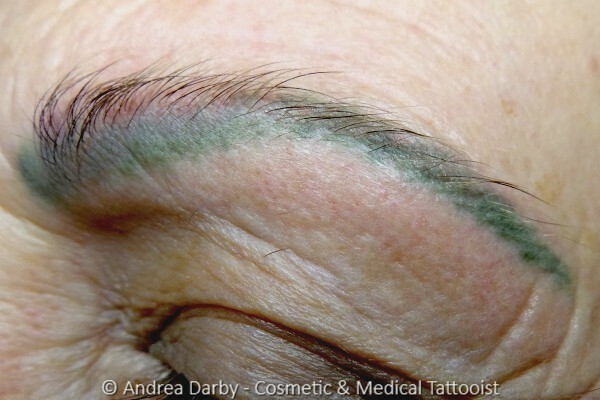 This client presented with a marked green colour change in her brow tattooing that was performed by another cosmetic tattooist approximately 5 years previously (whom I contacted to establish exact details on the original pigment that was used for the service), there had been no prior tattoo removal attempts and the client did not wish to undergo tattoo removal. Colour correction was performed over 4 procedures and annual refresh will be required for maintenance. NB. The original pigment was not manufactured by Amiea. What Might Cause a Green Colour Shift after Tattooing in Some Cases? 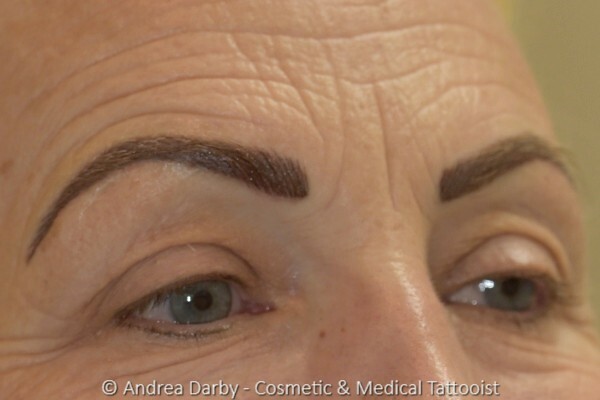 Over recent years there has been some controversy among members of cosmetic tattoo industry regarding green colour change in a few cases, some industry members have claimed that the green brows they encountered could not be colour corrected and that tattoo removal attempts resulted in migration in some cases. The source of the green colour shift will depend on what type of pigment range was used and the cause may depend on a variety of factors, in some instances it may simply be that other colourants within the pigment mixture have faded faster than a green component within the mix. If a body art tattoo pigment was inappropriately used for a clients original service then the green colourant within the pigment mixture may have contained a copper based colourant compound as has been found by chemicals regulators in a number of products in the market place e.g. If a body art pigment had been used by the original tattooist then I would not have attempted a colour correction as migration would have been much more likely with these types of colourants and they also tend to bloom through colour correction attempts. 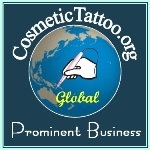 I this particular case a cosmetic tattoo pigment had been used for the original service, it is best to check but in general cosmetic tattoo pigment manufacturers are more likely to have used a chromium oxide based colourant for a green component in a pigment mixture rather than a copper based colourant compound e.g. NB. Chromium Oxide can vary in colour between black, blue, green, yellow and orange depending on the oxidation state of the individual chemical, Cr2O3 tends to be a green or slightly bluish green colour and chemicals such as Ammonia and Hydrogen Peroxide might affect the oxidation state of Chromium Oxide. Chromium Oxide Cr2O3 is quite a stable insoluble chemical colourant but it might react with a range of chemicals that may be found in beauty, skin, and hair lightening/tinting treatments or home remedy tattoo removal products that might potentially affect the colour, particle size or solubility of the colourant compound e.g. Acids, Alkalis, Ammonia and Hydrogen Peroxide etc. Conclusion: Colour correction of a green colour shift in a brow tattoo may be achievable by a cosmetic tattooist who is experienced in restorative/corrective tattooing however it will depend on the type of colourant used in the brow tattoo and I would not attempt correction if there has been any prior tattoo removal attempts as migration of the green colourant would be much more likely in that instance. For the vast majority of Cosmetic Tattoo procedures I advise against mixing pigment colours together as there is a risk of creating a 'mud mix' this is a muddy brown/blue/grey colour that can result from mixing colours unnecessarily, however for some specialised procedures such as this particular case the layering of a series of colours over successive treatments is required for an optimal result. Pigment Layering, Sweep, Perfusion and a range specialised needle techniques were utilised for this service. "Really phenomenal, I did not know it was even possible to move pigment in the skin in this way and I was told by my trainer that you cant correct green brows, now I know better.